Newly appointed FOM chief Ross Brawn clarified how the trio of Chase Carey, Sean Bratches and himself will take over the regime from the long-time F1 supremo Bernie Ecclestone. The Briton admitted they still rely on Ecclestone’s advices. On 24 January the news broke out that Bernie Ecclestone was deprived of his supreme role inside the Formula One Group which controls the commercial rights of the sport. That was a result of a long process and on Monday the last important piece of the puzzle was put in place. Liberty Media completed an important transaction of its take-over of the shares of the Formula One Group which gave them 35,5 per cent of the shares, and more importantly it provided them with the voting rights. The American media conglomerate was not keen on keeping Bernie Ecclestone on board and decided to part ways with the 86-year-old. Ecclestone’s role has encompassed such a scope of duties that it has to be divided into three major directions. Chase Carey was appointed chief executive officer and executive chairman of the Formula One Group. He will be responsible for the company with a more holistic view. 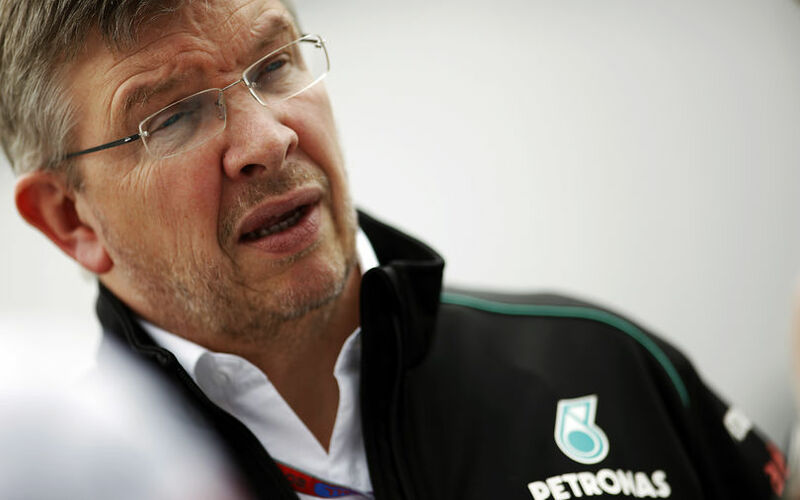 Ross Brawn will fulfil duties for FOM and will bring his expertise into technical matters. Sean Bratches, the former ESPN’ chief will head the commercial department of the structure. Bratches will be also responsible for a new territory which Formula 1 has not really exploited yet. This is the sector of the social networks. On contrary, there are tasks which will be managed by the trio together. Ross Brawn who was a key part of Ferrari’s last ultra-successful era and the reorganization of the current Mercedes team thinks there won’t be any clashes of interests and the trio will be able to work in harmony. “We will make sure that our decision-taking processes and responsibilities are clearly structured. We can do more together as a sole person,” Brawn is quoted as saying by auto motor und sport. Carey and Bratches will be responsible for the new contracts with the TV stations and promoters. Brawn promised that the trio will strive for improving the on-track side of the sport and giving more spectacles to the fans. The Concorde Agreements, which controls the way the income is divided and the decision-making process, runs out in 2020. That means the trio’s hands are tied in many commercial matters until then. However, it does not mean that changes cannot be introduced in the near future. According to Brawn the number of GPs during a season will also be evaluated. This is a difficult question to answer as many factors are affected – including commercial, political and sporting ones. Teams have a certain budget that gives an upper bound. Adding further races to the calendar would mean that teams were forced to restructure their operation. Brawn thinks the most important factor in that question is the quality of GPs and not their number. It is important that a wide variety of circuits are involved in the calendar to give the fans the most entertainment. Brawn praised the commitment of Bernie Ecclestone and the work the 86-year-old Briton did for the sport. “He is an icon, a unique character. He is absolutely irreplaceable. That is why Formula 1 has been reorganized. I cannot image someone who could manage the sport in the way he did. F1 needed someone like him in his time. I can only hope that he attends a couple of races and continue to support us,” concluded Brawn.